Ios is one of the southern Cycladic islands, lying south of Naxos, with Amorgos to the east, Sikinos to the west and Santorini to the south. It lies 107 nautical miles away from Piraeus and has an area of 108 square kilometers. It has an indented coastline with many attractive bays and sheltered inlets. It was originally called Phoeniki, because it was inhabited by the Phoenicians. According to tradition, it was later given the name of Ios by the Ionians who settled on the island at the end of the 2nd millennium BC. In Roman times it was used as a place of exile. Ios is renowned for its relationship with the great epic poet Homer. Tradition says that the great poet was buried on the island. There is, in fact, a ruin at Plakoto, which is called Homer’s tomb. During the Byzantine period, when it was known as Nios, it fell into decline and was almost completely abandoned. It was captured by the Venetians, who built a strong castle on the hill at Chora to protect it from pirate raids. In 1537 was occupied by the Turks. The final liberation came with the incorporation of Ios in the modern Greek State, which was founded by the signature of the protocol of London on the 10th of March 1829. Among all the Cyclades islands, Ios, locally called Nios, has been for many years the most loved by young people of all ages. And rightly so, since it combines all the ingredients of a Greek island that one would dream of: various beaches with crystal clear waters, unique sites of archaeological interest, and lively multi-colored nights. Port or Yialos, Chora (main city) and Milopotas. Ios still maintains a lively nightlife, the likes of which you will not see on the other islands. 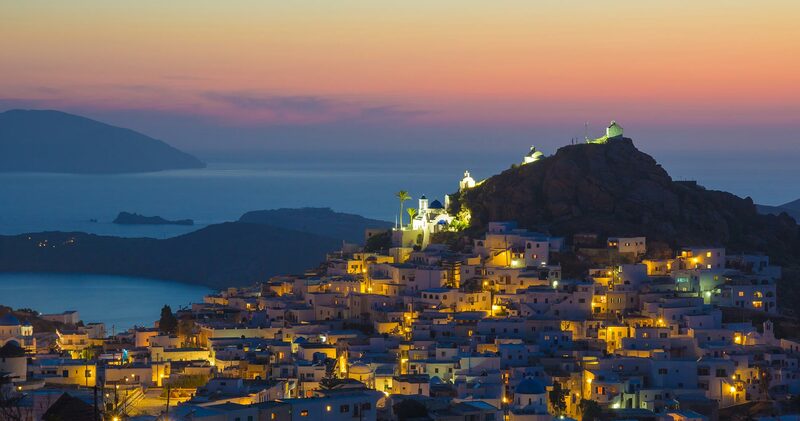 Unlike the "package resorts", the nightlife of Ios is concentrated in one place, Chora. The nightlife is very cosmopolitan and still quite traditional. The main meeting point is in the main square. For those not wishing to experience the nightlife by day, Chora reverts to a beautiful tranquil traditional Greek village where you can see the locals chatting in cafes and playing backgammon, it is wonderfully peaceful in the early evening and is awash with clothing and jewelry stores, souvlaki shops and excellent restaurants. Yialos or the Port is an excellent place to escape the crowds in the evening as is the beautiful Mylopotas beach. Regular Buses or Boats are on offer to take you on various excursions to the other beaches on Ios, where you can find real peaceful areas and avoid the crowds.